King, A. 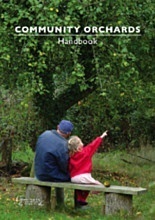 & Clifford, S.
Drawing on twenty years of championing orchards and the experiences of many people who have created Community Orchards, The Handbook offers philosophy and practical advice to those inspired to become Community Orchardists. Common Ground wants Britain to be a prominent fruit growing country once again for environmental, aesthetic, social, cultural and economic reasons, and believes that Community Orchards can help spearhead a revival. Authors: - King, A. & Clifford, S.